Following opposition from the city of Hailey, the Friedman Memorial Airport Authority has backed off of a proposal to acquire a small parcel of land at the airport’s northwestern corner to meet federal safety standards. During the Airport Authority board’s November meeting, airport Manager Rick Baird informed board members that the Federal Aviation Administration had expressed concerns about the configuration of a taxiway used by planes to enter the runway before taking off. The FAA has been examining ground operations at the airport as part of a $34 million, two-year construction project intended to bring the airport into compliance with congressionally mandated safety standards. The agency has been willing to modify some of those standards in Friedman’s case due to the airport’s limited space. 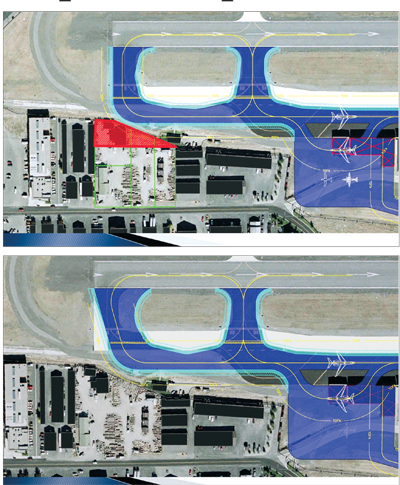 “Taxiway incursions are one of the No. 1 problems that the FAA is trying to address,” Baird said. The airport’s plan to remedy the problem has been to slightly angle the taxiway. However, in a letter dated Oct. 28, an FAA representative told Baird that the agency was not likely to approve that configuration, as it is not what pilots are accustomed to, and the same configuration at another airport resulted in pilots’ taxiing too far before stopping. The FAA proposed that the airport buy a small parcel of land adjacent to the airport’s perimeter to extend the corner of the taxiway. The board directed airport staff to investigate that possibility. “When you start expanding this thing, it looks like a permanent, expanded airport,” he said. Haemmerle’s concerns were echoed at a Hailey City Council meeting on Monday, Dec. 2, when council members agreed unanimously that the joint powers agreement would have to be amended if the airport grounds were to be expanded. At an Airport Authority board meeting on Tuesday, Dec. 3, Mitchell said the airport would need to buy parts of three lots totaling .42 acres from two owners. He said neither owner appeared interested in selling. “The city of Hailey’s position is very clear that we do not want to proceed with [the land acquisition],” Haemmerle said at the Dec. 3 meeting. Board Chair Ron Fairfax, a pilot, warned that the angled configuration could compromise safety since the pilot of a plane in that position may be unable to see down to the end of the runway. “I understand where the city of Hailey is coming from, but in the interests of safety, I don’t think that that’s what we should do,” Fairfax said. However, after further discussion, Fairfax told Baird that the board’s direction was to pursue the angled configuration as a solution. “I’m not sure that a new pilot standing at the hold line will not be able to tell that it’s not standard,” he said. In other business, the board set a meeting for Dec. 18 to review the qualifications of potential bidders for excavation and repaving to complete the airport construction project. In a legal notice published in the Idaho Mountain Express on Nov. 27, the Airport Authority estimated the cost of that work at $14 million. Once bidders are deemed qualified, the Airport Authority will be required by state law to accept the lowest bid. Additional bids will be sought for work to rebuild hangars and other buildings displaced by the expanded runway safety area. That will include a reconfiguration and expansion of the airport terminal.